The generally accepted theory is that a meteor strike at the Yucatan Peninsula was responsible, but there is an increasing amount of data to suggest that volcanism in ancient India was the real cause. Dinosaurs are charismatic megafauna that capture our imagination with their size and variety. The dinosaurs were wiped out along with 70 percent of all life forms at the end of the Cretaceous period, about 66 million years ago. 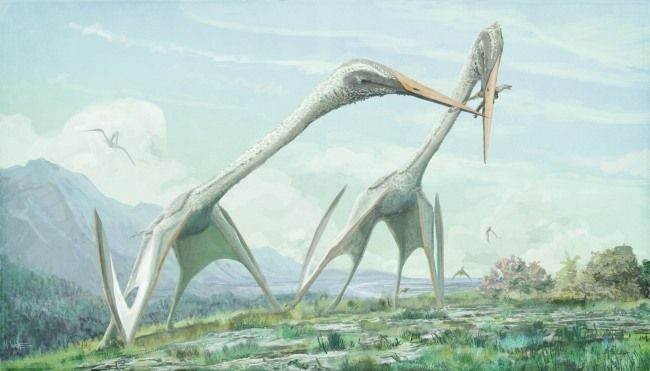 Pterosaurs, which were flying reptiles and the mosasaurs, carnivorous aquatic lizards also died out at these events. Both of these are equally charismatic megafauna, but are not dinosaurs, although they lived during the same time. One of the biggest unanswered questions in science is what exactly led to their extinction. Over the years, there have been many proposed explanations. In the Cretaceous period, angiosperms (flowering plants and hardwood trees) overran the landscape, replacing the ginkgos, cycads and conifers (roughly, ferns). According to some early extinction theorists, this onset of new genera of vegetation just a while before the extinction of the dinosaurs is no coincidence, it is the cause. The herbivores did not evolve fast enough to eat and digest the new plants, and because of this, they starved to death. As a consequence, the carnivores that depended on the herbivores as a food source also starved to death. The theory fails to explain the extinction of marine reptiles. In 1962, an entomologist by the name of SE Flanders published a paper in the Journal of Research on the Lepidoptera suggesting that caterpillars killed the dinosaurs. 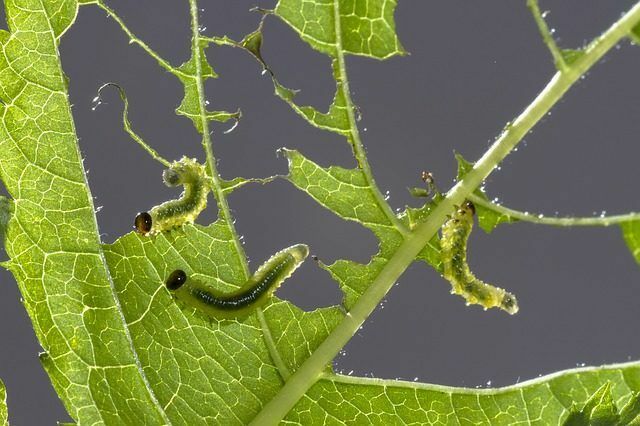 In the middle of the Jurassic period, the caterpillars emerged, around the same time as the advent of flowering plants. For a brief time after their emergence, they had no natural predators. According to Flanders, without any external regulation, the caterpillars went on to consume all the plant matter. This left the herbivores without any food, and they starved to death. The death of the herbivores started a trophic cascade that ended with the extinction of all dinosaurs. However, the death by caterpillar theory has been discarded because of several reasons. It does not explain why small mammals also died off, and molluscs in the sea that were not part of the food pyramid that the caterpillars supposedly disrupted. The reptiles of the sea and air also went extinct at the same time. Ophthalmologist LR Croft proposed that the dinosaurs became extinct because they went blind. In the 1982 book, The Last Dinosaurs: A New Look at the Extinction of the Dinosaurs, Croft argued that a global rise in temperatures led to dinosaurs going blind. Even in human eyes, prolonged exposure to heat and light can cause cataracts. As supporting evidence, Croft argues that the structures around the eyes and heads of dinosaurs such as spines, ridges and bones were all there to protect their eyes from intense solar radiation. As the dinosaurs went blind en masse, they could no longer find the food, and thus starved to death. This theory does not adequately explain why the lizards, turtles and crocodilians survived the extinction event, or why the ammonites in the sea did not. The methane from farting bovines is a significant component in the amount of greenhouse gases emitted into the atmosphere. If cattle can contribute so much to global warming, then the question arises about how much the giant plant-eating long-necked quadruped dinosaurs emitted. These are a group of dinosaurs called sauropods and included the brachiosaurus, the diplodocus, the apatosaurus and the brontosaurus. A 2012 study estimated that the global production of methane from sauropods was around 520 million tonnes per year, which is comparable to current levels. 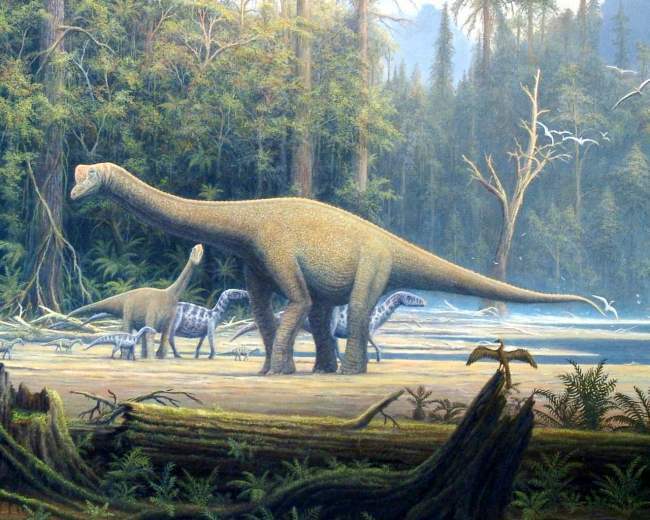 While the paper was a serious effort at estimating the amount of methane pumped into the atmosphere because of the sauropods, they did not go as far as to say that the resulting climate change caused the extinction of all dinosaurs. That leap in logic was taken by news sites in the quest for viral headlines. In S04E10 of the History channel TV series, ancient aliens have a wild proposition for what killed the dinosaurs. According to the theory, the dinosaurs died in an extermination event, and not an extinction event. Instead of the global iridium layer being caused by an asteroid impact, the layer was the result of nuclear explosions. Further evidence for this is the heavy lead painted on top of fossil skeletons of some dinosaurs showcased in museums around the world. This is because the remains are radioactive. The reason some fossils are radioactive is much more mundane than nuclear weapons by ancient aliens. The ground itself is radioactive, and if the bodies were deposited in the regions with a large amount of radioactive minerals, then the resulting fossils are radioactive. The episode uses a combination of science and pseudoscience to propose the ridiculous extinction theory and does not stop there. It even goes on to claim that some dinosaurs survived the extermination, walked the Earth alongside humans, and may even be alive to this day. Apart from the ridiculous, there are a whole bunch of other theories that are being investigated by a small number of these researchers. One of the theories that has almost been discarded by most scientists – is a global pandemic. Essentially, the idea is that diseases killed of the dinosaurs. A number of diseases have been pinpointed, including a plague, malaria, sleeping sickness, parasites, bone infections and cancer. Roy Lee Moodie was one of the earliest practitioners of a field known as palaeopathology. The idea is to study the fossilised remains of the dinosaurs, and figure out if they were affected by any diseases. He wrote a book on the subject. Moodie noted that the number of broken bones and infections spiked around the time of the extinction of the dinosaurs. His conclusion was that the dinosaurs were killed by various diseases and that these diseases died off with them. There are still a few palaeopathologists who are investigating the possibility of widespread diseases killing off the dinosaurs. The work of George and Roberta Poinar inspired Jurassic Park. According to their theory, insects played a major role in the demise of the dinosaurs. 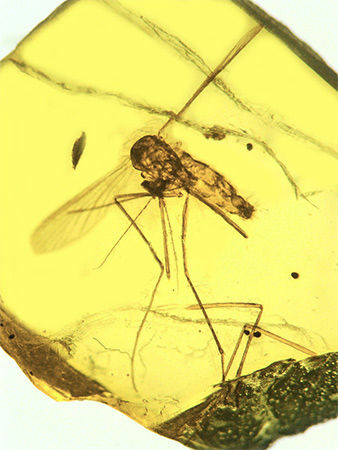 They have found amber specimens with insects still trapped inside them – including mosquitoes and sandflies. Within the guts of the insects, are the blood sucked from the giant reptiles. The insects are studied by carefully cutting the amber away, until there is just a thin layer of it between the insect and the microscope. Among the blood cells, the researchers also identified microorganisms – parasites that spread diseases that are still around to this day. 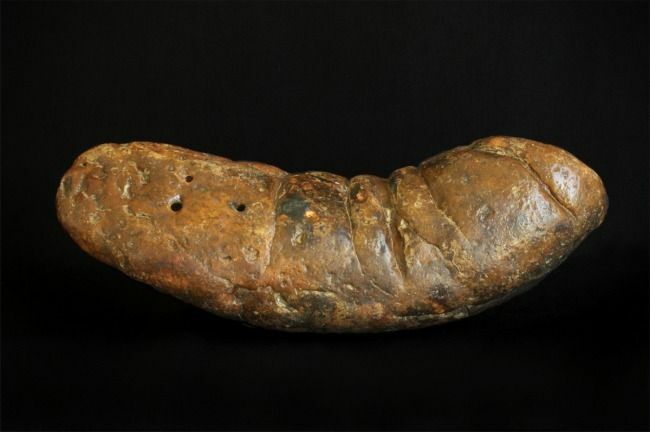 Additionally, coprolites – the fossilised dung of the dinosaurs show lines of burrows – which indicated that the stomachs of the beasts had worms within them. The dung from herds of sauropods would be extremely effective at harbouring and spreading disease spreading microorganisms. Now conclusively proving widespread diseases among the dinosaurs is a monumental task, considering there is very little skin and tissue to work with. However, scientists holding on to the belief of a disease killing off the dinosaurs point out to an extinction by a disease that might be ongoing. Since the 1970s, hundreds of species of frogs and salamanders have gone extinct – all because of diseases. By and large, though, the wider scientific community does not believe that a pandemic wiped out the dinosaurs. The main reason for this is that the marine reptiles and the and shelled creatures are unlikely to be affected by the same vectors of spreading diseases. The sandflies and mosquitoes could not possibly have bitten them too. In 1971, Dale Russell and Wallace Tucker proposed that the dinosaurs could have been killed off because of a nearby supernova. The amount of radiation because of the supernova would be enough to directly cause radiation sickness to the dinosaurs. A stream of high energy neutrinos could cause genetic mutations and cancers. With an intense enough nova, the ozone layer could have been wiped off for a few centuries. This meant any surviving organisms would be subjected to a sustained period of global warming and exposed to intense cancer-causing radiation from the Sun. Unlike most of the proposed theories for dinosaur extinction, such a nearby nova would affect marine and plant life as well. At that time, Russell and Tucker did not identify a known source of the supernova that supposedly killed the dinosaurs. The remnant of the explosion would have been scattered across the galaxy and is difficult to identify 65 million years later anyway. Such evidence can potentially be found in the geological record. Interest in the theory was revived in 1993, by researchers associated with NASA and CERN, John Ellis and David N Schramm. The theoretical physicists published a paper calculating the effects of a supernova, and if it could possibly cause a mass extinction event. The conclusion was that about once every 100 million years, there is a supernova within 10 parsecs of the Earth, which can wipe out the ozone layer for a few centuries. The paper points out that the dangers of supernova explosions have been underestimated so far, and that further study is required in the area. The first person to suggest that an asteroid impact could have wiped out the Earth was MW De Laubenfels in 1956. The starting point for the theory was the mysterious Tunguska event of 1908. Considering the damage caused by the unknown object, De Laubenfels calculated the consequences of a much a larger strike. According to the paper, the dinosaurs were wiped out by “hot winds” by a large meteor strike. In 1980, a team of researchers led by Nobel Laureate Luis Walter Alvarez published a blockbuster paper. In the paper, the researchers announced the finding of a global layer of iridium in the geological record. Iridium is an abundant element in the bodies of the solar system, including asteroids. Most of the iridium in the Earth is expected to be deposited within its core, and very little is in the crust. The researchers concluded that the iridium layer, now called the iridium anomaly, was deposited by an extraterrestrial object – most likely an asteroid. The iridium layer also has shocked quartz. The substructures in the crystals were knocked out of place by seismic waves travelling around the globe. About 60 percent of the mass of the object would be injected into the atmosphere as dust. This dust would spread across the world, and eventually settle down everywhere. The dust would block out the sun, wiping out the bottom of the food chain – plants and phytoplankton in the oceans that produce oxygen. An asteroid about 10 kilometres in diameter striking the Earth would be able to cause such an impact. The impact would cause a crater about 100 kilometres in diameter. Unknown to the researchers, such a crater had been discovered just two years before the paper was published. Geophysicists surveying the Gulf of Mexico for possible oil drilling locations noticed a vast crater embedded deep within the continental crust. The crater was 150 kilometres in diameter, expected to be caused by an object between 10 to 15 kilometres in diameter, and was reliably dated to within five million years of the extinction event that wiped out the dinosaurs, and 70 percent of all other species. 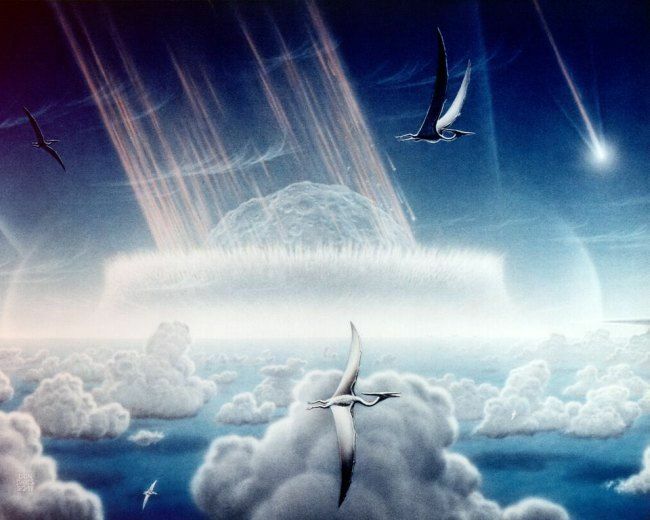 The Chicxulub crater was the “smoking gun” for what is called the Alvarez hypothesis. The asteroid strike theory has since then grown to be the most widely accepted cause for the Cretaceous–Paleogene (K–Pg) extinction event, previously known as the Cretaceous-Tertiary (K–T) extinction event. A link between volcanism and the K-Pg extinction event was first proposed by a 1978 paper by DM McLean. According to Dewey McLean, volcanic eruptions first put particulate matter into the atmosphere, which led to a period of global cooling. The organisms were adapting to the cooling when a runaway greenhouse gas effect led to a sudden period of global warming. The organisms could not evolve rapidly enough to survive this sudden development, which is why most of the life forms on Earth died out. Since then, there have been a small number of scientists holding on to the volcanism hypothesis. In a 2003 paper, Vincent Courtillot and Paul Renne published a paper showing that most of the major mass extinction events are associated with increased volcanic activity. For example, the massive volcanic outpourings from the Siberian Traps are believed to be the cause of the Permian–Triassic (P–T) extinction event. It is the only known mass extinction event for insects, and about 90 percent of all life forms were wiped from existence. Life on Earth took ten million years to recover from the P-T extinction event. Courtillot and Renne proposed that increased volcanism was the general explanation for all mass extinction events. While all the major extinction events are chronologically linked to known sources of increased volcanism, only the K-Pg extinction event is linked to an impact crater. Considering the rarity of the impact craters of a similar size, and the frequency of flood basalt plains, the authors show that periods of increased volcanism are more common than large asteroid strikes. The paper goes on to demonstrate that while the volcanism is sufficient to cause the extinction on its own, and the only clear evidence of an asteroid that could have caused a mass extinction is during a period with increased volcanism. One of the biggest opponents of the Alvares hypothesis is Gerta Keller, a palaeontologist from Princeton University. 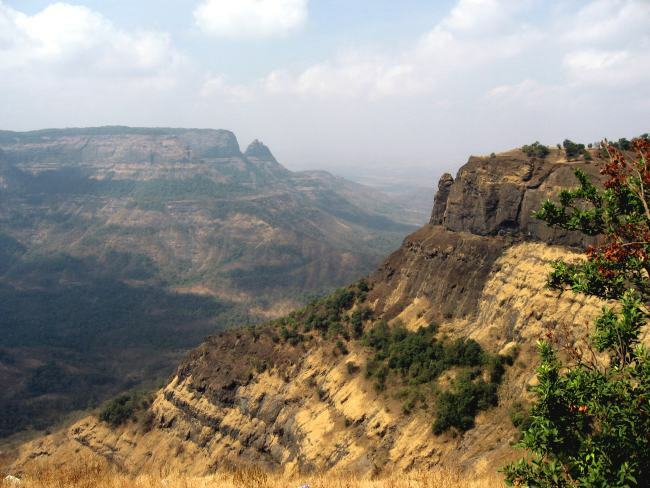 Keller, along with Ashok Sahni from Punjab University and Sunil Bajpai from IIT-Roorkee have published research linking the massive volcanic outpourings in the Deccan traps to the K-Pg extinction event. The igneous rock that we read about in the boring geography textbooks are actually the remains of massive floods of lava. The Deccan traps, an igneous province that covers portions of Gujarat, Madhya Pradesh, Maharashtra and Northern Karnataka are one of the largest volcanic features in the world. The massive eruptions reached over 1000 km across India, and could well be the longest lava flows known to man. What remains of these layers of cooled down lava are the stratified rocks that we see in the Deccan traps today. According to the volcanism theory, the massive eruptions pumped sulfur dioxide and carbon dioxide into the atmosphere, over a period of a million years. The sulfur dioxide would have cooled the atmosphere, while the carbon dioxide would have heated it. The geological record shows mixed signals, with some rocks showing a period of cooling, while others showing a period of warming. One explanation is a period of cooling followed by a sudden period of warming, and a runaway greenhouse gas effect. The carbon cycle of the Earth was disturbed, and this led to the K-Pg extinction event. The volcanism also explains how the iridium got released into the atmosphere of the Earth and was deposited all over it. While the debate got murky at times, the two theories are not totally at odds with each other. Researchers have been trying to accurately date the Chicxulub impactor, and some findings suggested that the asteroid had struck slightly before the extinction event. The best dating techniques now show that the strike coincided almost exactly with the extinction. However, that does not mean that the Chicxulub event was the only cause for the extinction of the dinosaurs. It could be that the asteroid strike was the “last straw”. The fossil record shows that almost all the non-avian dinosaurs had been wiped out before the asteroid struck, which would make the volcanism in the Deccan traps the only available explanation. Even in the 2003 paper, Courtillot and Renne did not consider that the Chicxulub impact as opposed to the volcanism hypothesis. Instead, they proposed that the perceived consequences of the strike were lesser than previously thought. The meteor was not the single reason that the dinosaurs died, but it did manage to wipe out species that were already stressed. 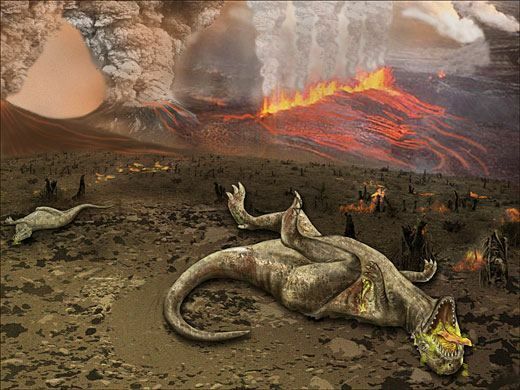 The authors maintain that volcanism was the main agent for the K-Pg extinction event. There are some questions still to be answered in the one-two punch or hybrid theory of dinosaur extinction. Essentially instead of just a single factor, it considers both the volcanism and the impactor as contributing factors. Out of the two, the volcanism could have finished off the dinosaurs on their own. The question now arises on how much the volcanism and the strike contributed to the extinction. While the volcanism was spread out over a million years, about 90 percent of the lava flows are suspected to have occurred right around the K-Pg boundary. A more precise dating of the layers in the Deccan Traps is needed to resolve the remaining questions.